This new energy saving Infrared Ceiling switch utilizes an integrated circuit manufactured with the latest surface mount technology, has excellent detection sensitivity and a rapid response time. Its design incorporates automatism, convenience, safety, energy-saving and practical functions. The wide detection range covers 360 degrees. It works by seeing human body heat in motion via infrared rays. It is designed to replace an existing wall switch for interior lighting. It can start the controlled output load (light) immediately when a person crosses the detection field and it will not switch on unless the room is dark or dimly lit. 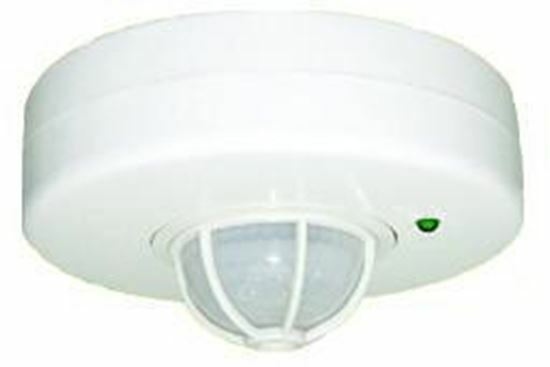 The unit incorporates a simple three wire installation, a status indicator LED light and built-in photocell. - This switch controls incandescent bulbs, compact florescent bulbs (CFL) and florescent fixtures with Electronic Ballast. - Relay motion sensor occupancy switch. No flickering with CFL and Florescent Bulbs with Electronic Ballast. THIS IS NOT A SINGLE POLE SWITCH. IT NEEDS HOT AND NEUTRAL WIRES WELL IDENTIFIED IN ORDER TO WORK. Please see the installation diagram below. - Identify day and night automatically. Can adjust ambient light according to your desire: when turn to SUN (max), it will work day and night. When turn to MOON (min), it will only work under less than 3LUX circumstance. As for Adjustment, please refer to testing. - Detection distance can be set according to installation position and detection field. - The power show and detection show: they will flash one time each 4 seconds after putting through the power, and flash two times per second when receiving the signal. At the same time, it shows the sensor in the normal conditions for detection. - Time-delay adjustment: it can be set according to your desire. The minimum is 8+/-3 sec; the maximum is 7+/- 1min. - Locking function: during working, sensor will keep load lighting when power is shut off 2 seconds and then on. And shut off the power for 4 seconds and then on, sensor will resume automation.